It's a little strange that Kythira would be considered one of the Heptanese, the 7 islands of the Ionian sea, but it is. Geographically it would better to think that it stands alone, especially since it is far closer to Crete (73 km) or the Cyclades (130 km) than it is to any of the other Ionian islands, the closest of which is Zakynthos (260 km). Besides, it isn't even in the Ionian sea; it's clearly a Mediterranean island. But there you have it. If it weren't part of the Heptanese, the grouping would have to be called the Hexanese; and it can't be part of Cyclades, since "Cyclades" means "circular," which is the shape that group of islands describe. Kythira would ruin the circle. Despite that, it was indeed considered one of the Cyclades in antiquity. There are two islands in the area; the just-offshore Elafonisos, and the 33-km distant AntiKythira. 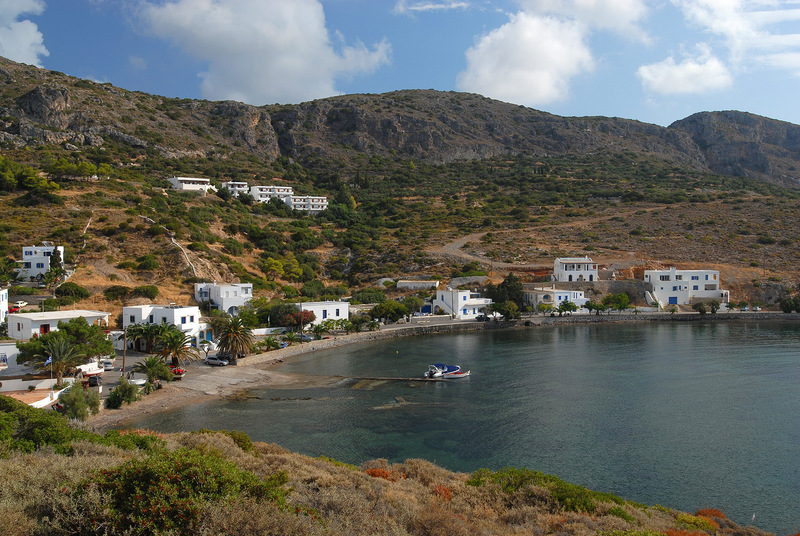 Kythira is reachable by ferry from 15 km-distant Neapoli, which is at the bottom of the easternmost of the three "fingers" of the southern Peloponnese. You can also get there directly from Athens on a ferry which leaves once a week during the summer. The infrequency of this ferry is the first indication that Kythira is not as well-known a destination as other Greek islands. Which is perfect for those whose goal is a quiet holiday. 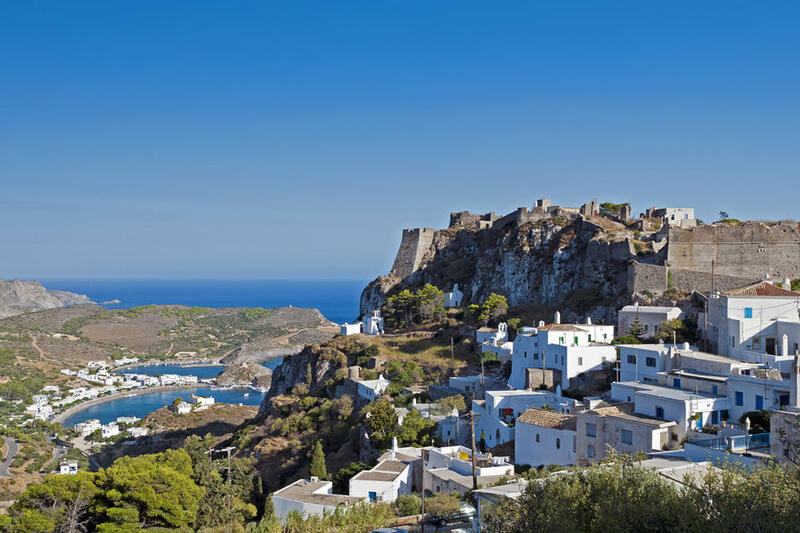 Kythira is popular with Australian emigrants originally from the island, who come back in their thousands during July and August, and with Greek nationals, who know a good place to vacation when they see one. Kythira has many unorganized beaches, and is a refuge of sorts for families and people seeking an off the beaten track experience. 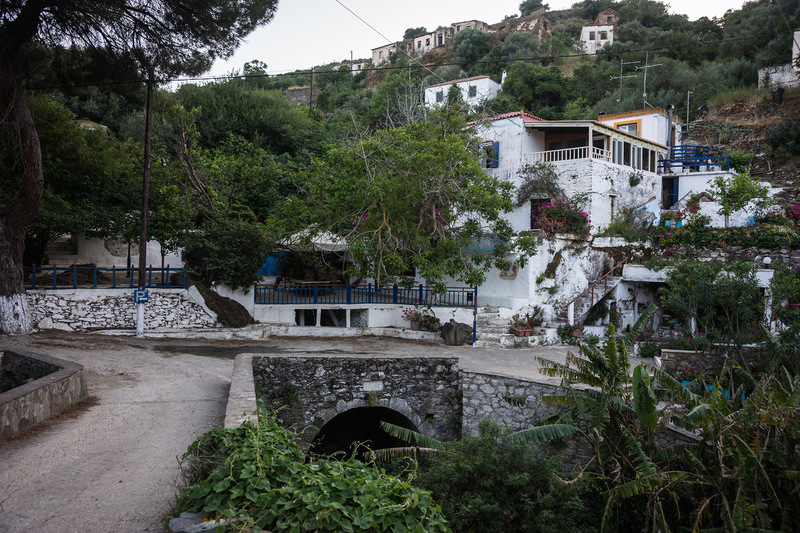 The chief tourist spots are the capital, Hora, Avlemonas, Agia Pelagi, Kapsali, Milopotamos, and the Agia Moni monastery. There are also a number of scenic mountain villages, and scattered ruins. 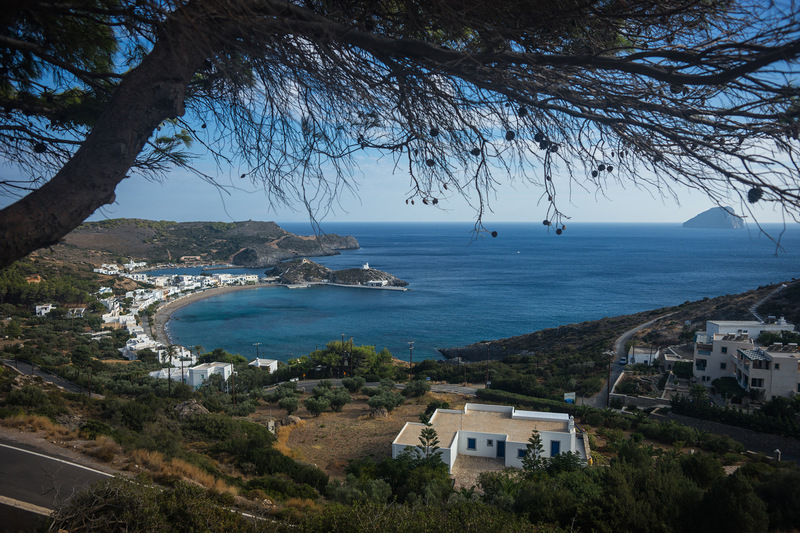 Historically, Kythira's location has always been very strategic, situated as it is at the southern end of the Greek mainland, commanding sea lanes from the Mediterranean to the Aegean. Because the seas can be rough in this part of the Mediterranean, there have been a large number of shipwrecks in the area from antiquity. The most famous of these was the AntiKythira wreck, dating from about 80 BC. Discovered by sponge divers off AntiKythira in 1900, it has yielded the greatest number of artifacts of any shipwreck during the Hellenic/Roman era. It is now believed that the ship was carrying Athenian loot to Rome when it was lost in a storm in 86 BC, under the leadership of Roman General Sulla. Sulla had just captured Athens after a siege during the First Mithridatic War, waged against Asia Minor-based Greek King Mithridates the Great, also known as the Poison King because of his use of home-brewed poisons to dispatch his enemies. The most intriguing item recovered was called the AntiKythira Mechanism. Now called the “world’s first computer,” this clockwork-shaped, device predicted the movements of the sun and planets, and celestial phenomena like eclipses. It is now in the National Archeological Museum in Athens. Kythira was first ruled by the Phoenicians, then the Cretan Minoans, followed by, at different times during the classical and Hellenistic era, Sparta and Argos. Then came the Romans, and then, during the first millennium, AD the Byzantines. In the early 1200's, after the 4th Crusade, Venice took control of Kythira, and patrolled the waters in the area to protect the sea lanes for trade with Constantinople. was so devastating that it has been remembered by locals even today. Napoleonic France took over the island in 1797, which is when Kythira began to be grouped with the Ionian Islands. In 1797 it passed under the authority of Russia, via the Ottomans, as part of the Septinsular Republic, which gave the Heptanese a measure of self-government. In 1809 the British took over, finally giving Kythira and the other Ionian islands to Greece in 1864. There are a lot of topographical features on Kythira, which means that a variety of plant species grow there. Much of the land in the valleys, which collect the winter rains, is given over to olive cultivation, which is one of the chief occupations of the islanders. What forest land there is can be found mostly in the north. As is the case with many other Greek islands, which have been largely deforested, you see shrubs ion the shaded sides of ravines on Kythira. Thyme is a very common plant, which the bees use for honey production, giving the local honey a unique fragrance. Kythira is rich in herbs, as well. Its most famous plant is the sempreviva (Latin for “always living”) which puts forth a long-lived, yellow blossom. Spring brings a local wild tulip, the kastaniola. As far as animals, what is missing, fortunately, from Kythira are any kind of poisonous snake. It has many hares, and tortoises, exactly the same type of animal Aesop told us about so long ago. There are small reptiles, and different species of birds of prey. Kythira is also a stopping off place for migratory birds heading to and from Africa. The newly re-opened Archeological Museum of Kythira is in the capital of Hora. It was closed for 9 years, and re-opened on May 7th, 2016. The museum has been completely renovated. It's the place to go to find out about all the significant archeological sites on the island, and on Antikythira. Exhibits are laid out chronologically, dating from 5,000 BC to the Middle Ages. Finds displayed include a 6th century, BC marble lion, pre-historic pottery, marble sculptures, clay figurines, and coins. The cavern of Chousti, in Diakofti, features archaeological excavations which have brought to light objects dating from 5000 BC. Not far away is a path leading to the hill of Paleokastro, the island’s ancient capital. The Paleokastro site includes the church of the twin saints, the 3rd century physician/martyrs Cosmas and Damian, (patron of physicians), known as the Agioi Anargyroi. The church was built on the site of the ancient sanctuary of the twins Castor and Pollux, called the Dioscuri, (patrons of athletes and sailors). Further up, around the church of Agios Georgios (Saint. George) on the Mountain, recent excavation has located a sanctuary dating from the geometric years. ­­In Paleopoli, after contacting the Archaeological Museum staff for information, you can visit the many tholos (domed) tombs dating from the Minoan era. You can also visit the remains of the castle that guarded the port of Skandias until the early Byzantine era (7th century). Over on AntiKythira, halfway to Crete at 35km southeast of Kythira, archeologists have been doing research in the area of Aegila, where a small walled city has been discovered dating from the 4th century, BC. It is thought that the city was the base for pirates who would capture ships passing the heavily-used sea lanes both north and south of the island. 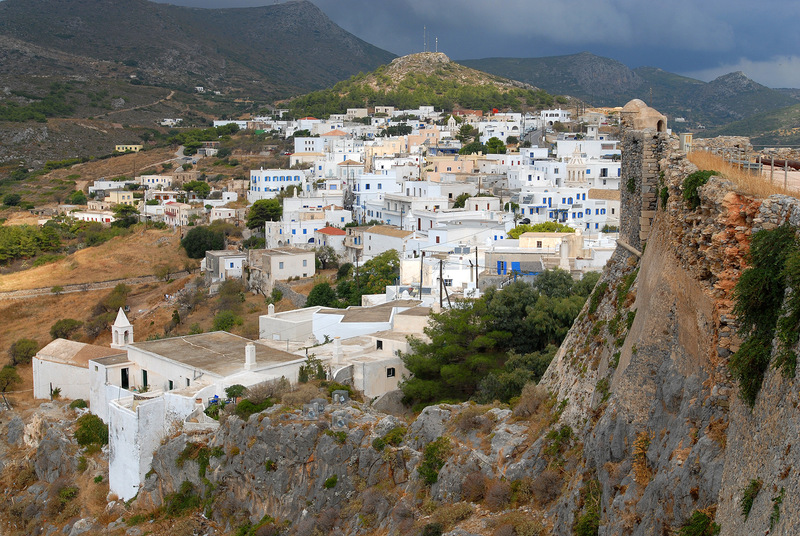 Kythira makes a perfect holiday destination for those wishing to get off the beaten track. The island does tend to get a bit crowded, but not overwhelmingly so, during August, however, when returning Kytherians from Australia show up.